October 3, 2006 | Dusk in Farmington, Utah. A wind is winding its way out the mouth of Farmington Canyon and across the midway of Utah's own magic kingdom: Lagoon, a family-owned amusement park tucked up against the mountains, 17 miles south of Ogden or north of Salt Lake City. On a summer day, Lagoon knows "what fun is," and during the daylight on a weekend in October, the vision is the same. BREWING UP A SCREAM: Witches perform at Lagoon. It's red and blue with flashing lights. It's the smell of freshly made french fries and popcorn. It's the rattling in your ears, the screams of a hundred happy children and their parents, skipping and smiling from one bumper car adventure to the next roller coaster ride. But at night, Lagoon goes haunted. It's 6 p.m.. and the mist is starting to seep from the black-lighted entrance, kissing every speck of pavement, hugging every entry. The greeting trees burn orange and blink and wink as you walk by. They've been waiting for you all day. Once through the gate, you're at home -- the home of the dead. A graveyard, complete with tombstones, spirits and jack-o-lantern towers paints every flower bed. Who are these people? Bea A. Fraid -- Be very afraid. Al E. Mony -- I guess the payments really did kill him. M.T. Grave -- Where'd he go? You're in for a spirited ride, but not just on the Bat, the Spider, the Rocket, the Samurai, or the other Lagoon rides still in service. At night there are new attractions. The haunted kind. Lagoon is now home to four haunted mazes. Haunted Hollywood is an escape into an Alfred Hitchcock movie. It's a maze built from the scariest movies ever made -- scary enough to have you grabbing the guy next to you, whether you know him or not. Are you scared of clowns? No? The Fun House of Fear will try to change that, with room after room of possessed, perverse and all around demented clowns. Not sure how much fun you'll have in their house. Hal O. Ween High -- "Your worst high school nightmares are about to come true." Ever been stuffed in a locker, picked on by the football team? Well . . . they're back! If the line is too long for your haunted maze of choice, try a stroll through Psycho Dave's Salvage Yard, a collection of Lagoon's old junk, old employees and old patrons, complete with a crazed junkyard dog. Watch your step. "Beware of Dog" is an understatement. If standing in line brings an uneasy feeling, don't turn around. You're being watched. Breathing down your neck, hissing in your ear, and finally a slimy hand on your shoulder. It's what you can expect from the Midway stalkers, a group of ghouls, goblins and creepy creatures that roam around all night long, and they all want to hear you scream. In what appears a private cemetery, a pink Cadillac is parked proudly, covered in mist and cobwebs, with a skull and crossbones license plate. The car's owners come stalking from the mist, a troop of nattily clad zombies, prepared to boogie till the sun comes up. With music blasting tunes such as Love Shack, Pink Cadillac and Hot! Hot! Hot! this dancing troop will mambo till dawn or until they fall apart, whichever comes first. If mambo isn't your thing, try a ghoulish group of a more modern persuasion. The Wailin' Witches are bound to boil themselves up the perfect guy and the perfect pop show. A floor, decked out Addams Family style, complete with caldron and skull chandeliers, sets the stage for a rocking good time. If you haven't already seen them jumping out at you from behind a photo both or tree, catch them in action with the whole team. Chubby, Slick, Slim, Crunch and the rest of the Hackenslash Chainsaw gang gear up for a little demonstration of their own. 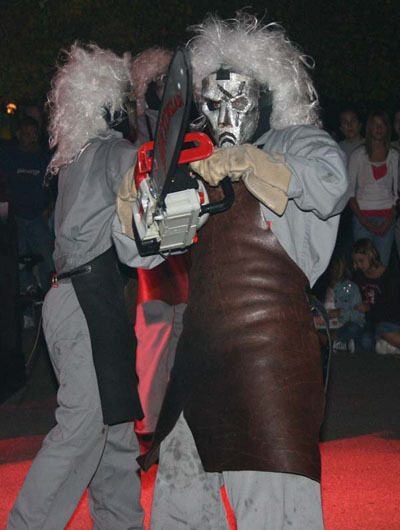 Each with their own metallic Jason mask and a pull-start chainsaw, prepare for a dance that will saw you socks off. For the timid, Lagoon provides a place of refuge. The Hypnotysm is a show for the kid in everyone -- and the Ricky Martin. Up to 20 people are pulled from the audience and hypnotized into doing the funniest, laugh-out-loud things. There's also a trick-or-treat walk for the kids, where the kids can visit with some of Lagoon's oddest characters, such as Farmer Joe, who guards the pumpkin patch and Professor Smarty Pants, the creator of dill- pickle-flavored cotton candy. Lagoon is open Fridays starting at 6 p.m., Saturdays, and Sundays starting at 11 a.m. until Oct. 28, weather and other factors permitting. Lagoon is also open Wednesday and Thursday during Utah Education Association school break. For more information call 1-800-728-5246 or visit www.lagoonpark.com.